Good Morning! 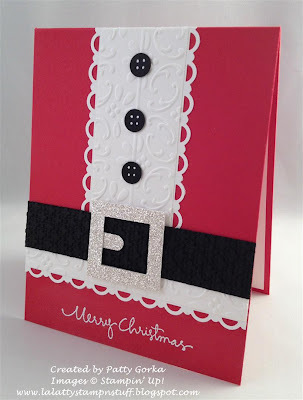 Today's 52 Christmas Card Throwdown blog challenge is a color challenge. The colors this week are: White, Black, Red, and Silver. As soon as I saw this week's color challenge I kept thinking Santa and I always wanted to try and make Santa suit card. I posted another photo below to try and show a close up view. My card base is real red and from there I began to build my Santa suit. I took some white card stock and ran it through my big shot using my final press embossing folder and then I added one score line down the center. Then I took another piece of white card stock and I punched each side using my scallop trim border punch and I layered my dry embossed piece on top of it. I did the same thing for the white trim below the black belt too. It's hard to see in my photo so I wanted to mention that the belt is dry embossed using my square lattice embossing folder. The belt buckle is silver. I used silver glimmer paper and I cut out a square piece and then punched the center using my 1" square punch. For the other smaller part of the buckle I used my word window punch. To make the buttons I used the circle punch from the Itty Bitty Punch pack and I simply added four small dots using my white gel pen. I wanted my Christmas sentiment to be in white ink so I decided to use white embossing powder and heat emboss my sentiment. I sometimes do this when I'm stamping white onto a darker color card stock, it makes the sentiment stand out and easier to read rather than just using white craft ink. When you are making a card with smaller details and layered onto dry (or heat) embossing you will want to use glue dots. Snail adhesive is not strong enough to hold this together. I used lots of glue dots on this card. Thanks so much for stopping by! I hope you like my Santa suit card! Be sure to take a moment to see the other design team member's cards on the 52 Christmas Card Throwdown blog. Have a great day! Patty, this makes me smile! So clever! Patty, this is cuter than cute. You have the best ideas. Bookmarking this one!!! Thanks. Adorable, wonderful card! Makes me want to run to my craft room and make a Santa card right this minute! Thanks Patty for the inspiration, a CASE is pending! This is cute and so well done Patty, I love it!